How to Use Meat Injectors? 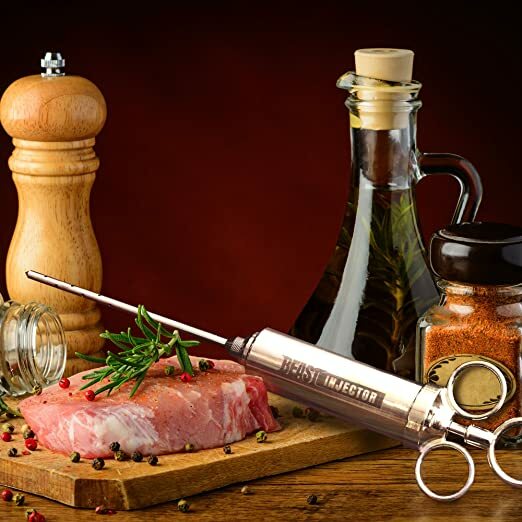 First, meat injector is defined as an ingenious device which allows you to prepare a flavorful, tender, and mouth-watering meat. It is also considered as a meat injector pump syringe that is used to infuse marinades as well as seasonings into the meat. It might be used on different roasts like a whole chicken or whole turkey and for smaller cuts of meat too. Indeed, this kitchen tool will add a new dimension to your roasting and grilling. Simply said, it is a big syringe along with a special needle used to fill the meat with marinade. So, why do we need to use meat injectors? If you are cooking, the meat could dry and might lose the structure. With that, injecting is considered as an efficient way to add flavor as well as moisture to the meat that we want to grill, roast or barbecue. Once done correctly, the meat might just bathe up the fluid together along with the oil, salt, and other spices. This will lead you to a final product that is so delicious as well as perfectly juiced meal. To know more about marinade injector, watch this. And of course, meat injectors are very easy to use. There is a need for you to choose on what type of liquid you would want to inject into the meat. 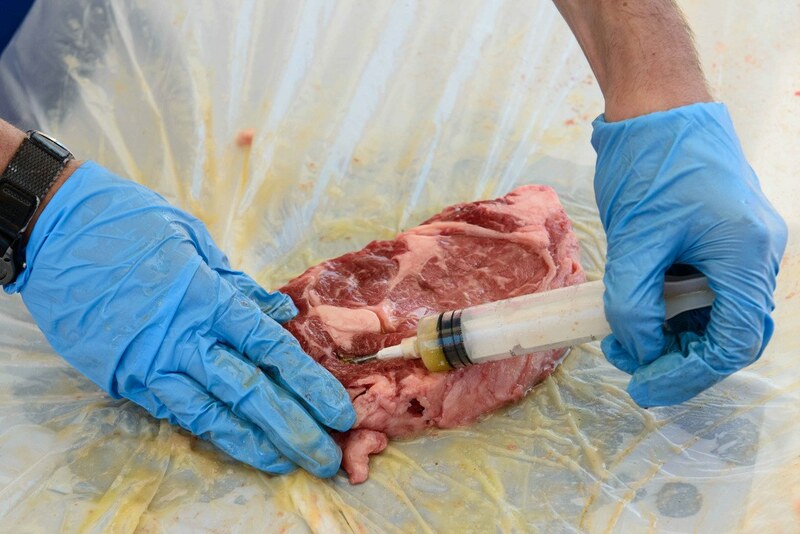 Then, you have to fill the meat injector with a marinade or liquid mixture of your choice, drawing it into the chamber with the use of a needle. Right after that, you only need to push the end of the injector and release the liquid from the chamber then into the meat through the needle itself. You have the control whether where the marinade goes, or where it is injected and also how much gets put into the meat at a particular time. Indeed, meat injector is a kitchen appliance which needs extensive culinary training or knowledge however it could immediately upgrade the food you have. But, there’s more! There are other ways that you could use a meat injector. Beyond using it for meat, after cleaning, meat injectors could be utilized for other kinds of culinary endeavors. They could be used to inject chocolate into the baked goods, liquor into fruits and yogurt to meringues. There could be endless options when it comes to the uses of a meat injector. You might watch this to learn more about injecting meat. There are also many benefits if you can buy the best meat injector. But two of the main advantages to ever experience is to marinate efficiently and to add moisture to almost all types of meats. With the conventional way to marinate meat, the mixture of the flavors doesn’t penetrate the surface of the meat. And so this would mean that the meat will only have its flavor outside. With meat injectors, flavorings are injected into the meat, and the liquid content helps in making the meat moist as you cook it. Along with that, it could also effectively help in turning large cuts of meat which take high heat temperatures to cook in order be served completely juicy in the inside. 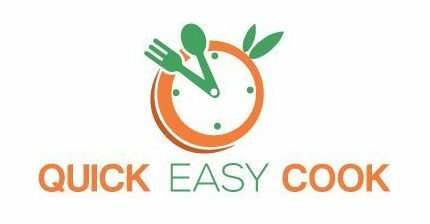 Besides, marinating meat might take a lot of time, in fact, you will need around half an hour in minimum just for soaking for the flavors to stick to the food. But with meat injector, the meat that you cook will contain all of the flavors of the marinade just within mere seconds. If you want to experience these perks, then purchasing the right meat injector should be considered. As you look for a meat injector, some might come with large wide needles while some with thin ones. The kind of needle you might need depends on the kind of marinade that you will use. For those who are using pure liquid marinades, a thin needle is fine. However, if you are into using marinades along with little chunks of herbs, large wide needles are recommended. Take note that the larger needle you consider, the harder it would penetrate the meat with. And of course, another important thing is to consider the overall ease of use. You try choosing a meat injector which you find easy to grasp as well as to manoeuvre. And try to choose dishwasher-safe products to practice proper hygiene. 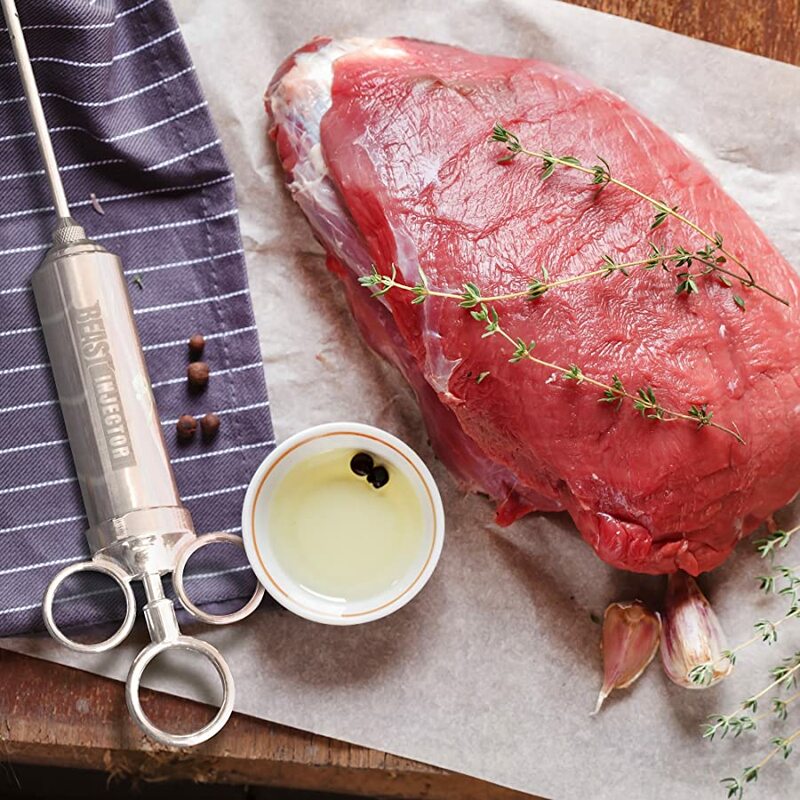 These are just among the most important factors that you should bear in mind as you shop for the best meat injector. You should be wary with regards to the size of the chamber. Once you are working with large cuts of meat a lot often then get one having a large capacity allowing you not to refill regularly. Bear in mind that the size of the chamber could affect how easy it is to clean the entire thing. The ones with smaller chambers seem to be a lot easier to clean than the larger chambers. If looking for one of the prettiest injectors in the market today, then this Grill Beast meat injector is the best choice which makes it deserves to be part of this list. Right from the box, this product could be used quickly to marinade almost all sorts of meats effectively. 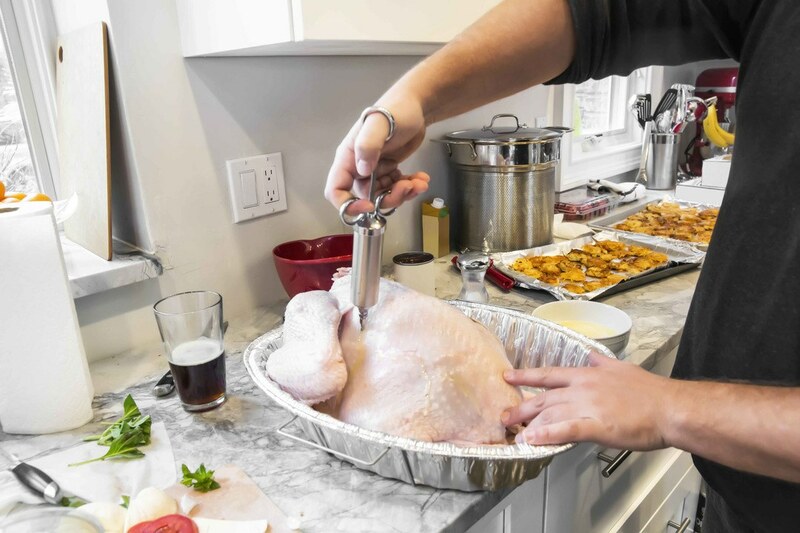 The best thing about this product is that it is made out of totally food-grade stainless steel which won’t feel flimsy once you push the plunger down the moment you inject the marinade in the meat. It also comes with three needles wherein you could use to inject pure liquid marinades as well as chunky sauces. And also, it comes with two ounces of a chamber which you could use to add marinades to small cuts of meat effortlessly. Along with that, it also comes with a lifetime warranty and also a money-back guarantee once you are not satisfied with the use of this meat injector. But this product might not be suitable for you if you are looking for a meat injector with more than two ounces capacity. And sad to say that the plunger rings of this product are less durable. 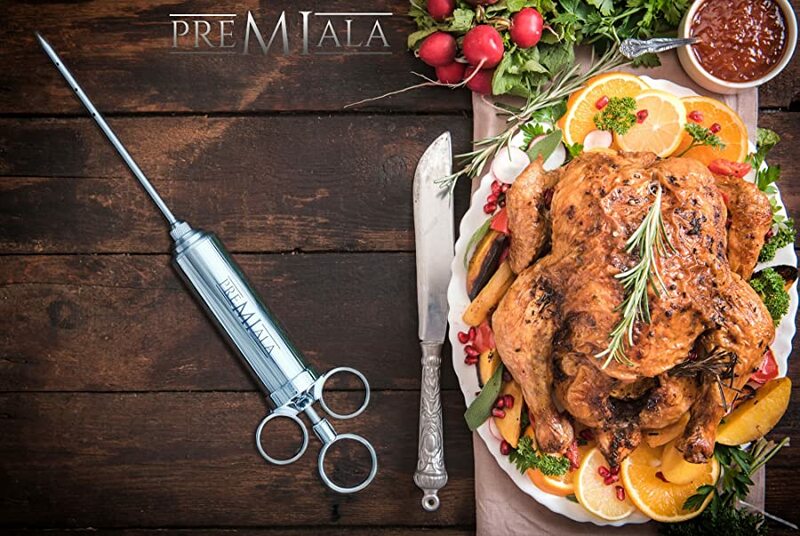 For the second option, it would be this Premiala Professional Flavor Marinade Injector Kit. 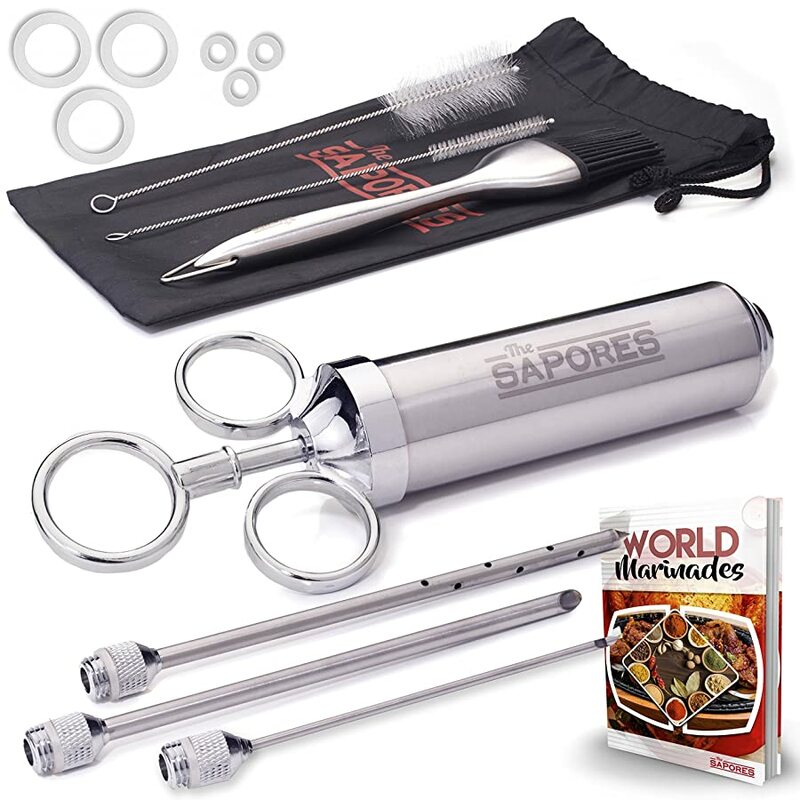 I included this on the list because of its sleek design and its 304 stainless steel perfect for usage in meat. You will be surprised with the fact that the metal used in this product will not rust even after long years of use. The largest one from the three needles included is a bit too wide, and it might lead for some marinades to leak right back out. This product could indeed work well even for chunky marinades. 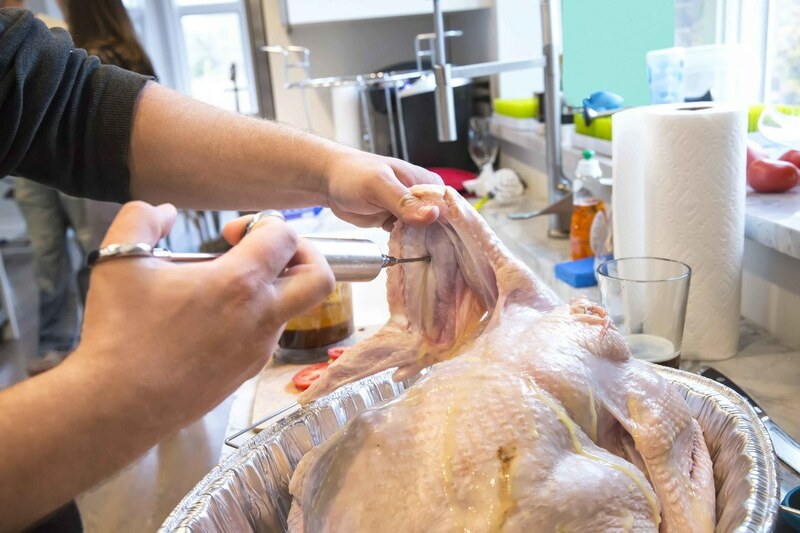 It also features spare silicon O-rings wherein if those begin to erode, it could be impossible to find a suitable fit without just replacing the entire meat injector. You might be a bit disappointed in the included eBook, however. It is filled with complex instructions that actually don’t help at all. You might also want a product that is simple yet high quality and easy to store and clean, right? 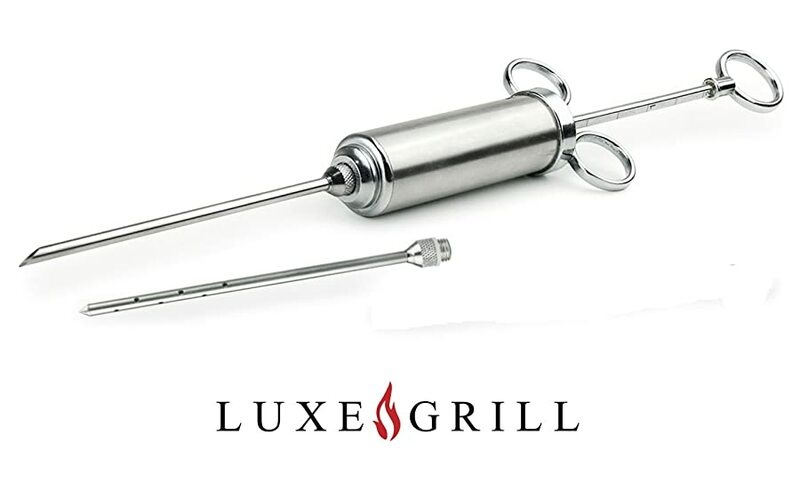 With this in mind, I included Luxe Grill Stainless Steel Meat Injector Set in this list. Considered as the cheapest pick, this product is indeed a simple choice though it doesn’t come with any accessories. But, this simple approach definitely works, and you will be surprised with the construction and quality of this product. You will be provided with two needles compared to some with three needles, but these two needles are perfect for liquid marinades and chunkier or thicker liquids. It has a slimmer and longer design compared to other models. But the plunger is a bit more delicate too. Indeed, the entire product is perfect if you are into meat injecting but not an ideal one for significant investment. 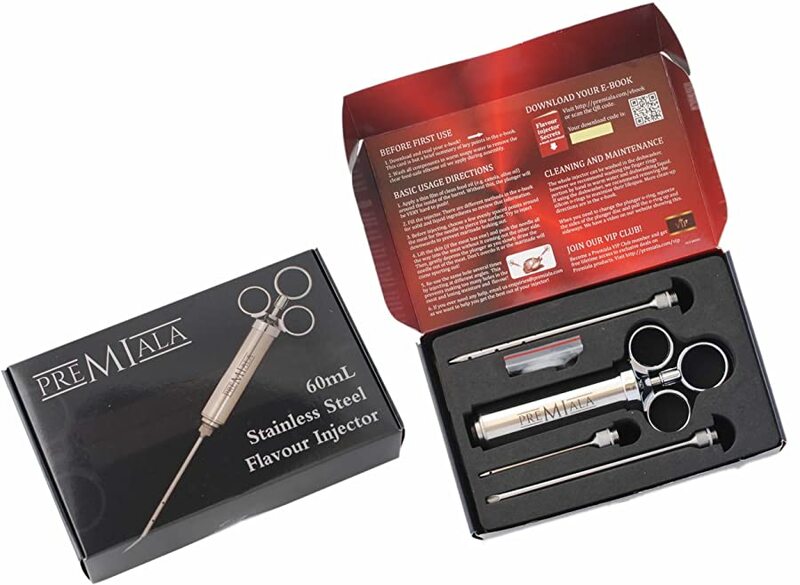 For a great collection of tools to inject meat, this product on the 5th spot is a great option to consider. 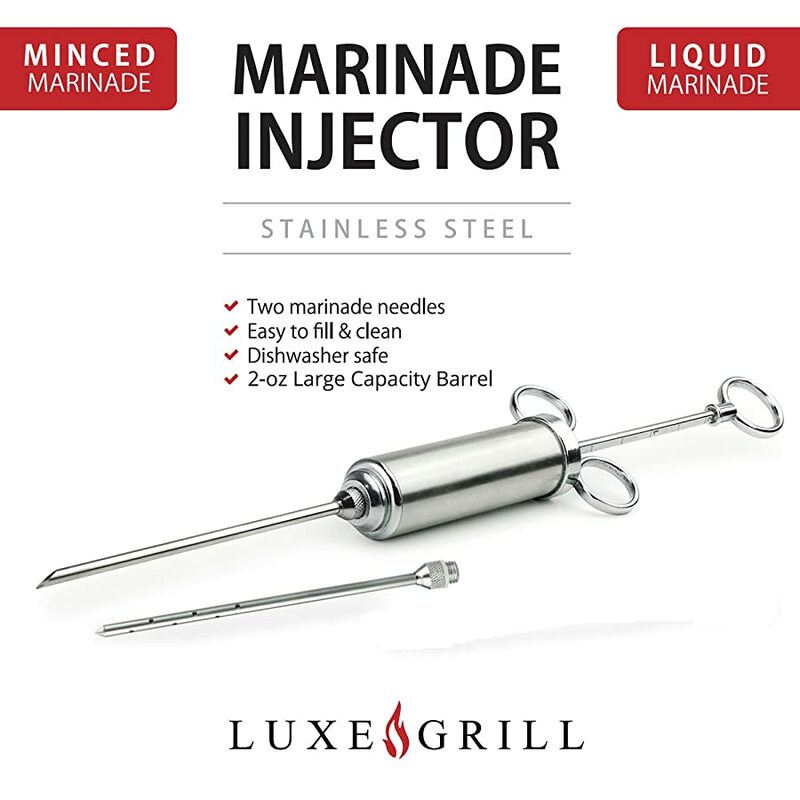 Three different needles are allowing you to inject marinades once needed. It also comes with a 2-ounce capacity that is perfect for most cuts of meat. Though it could translate into frequent refills once grilling or cooking ﻿﻿barbecues, it also offers basting brushes that are perfect for grilling along with a nice touch on the storage pouch. So why did I put this on top of the options? Well, though a bit pricey, this meat injector is a lot different from other products. 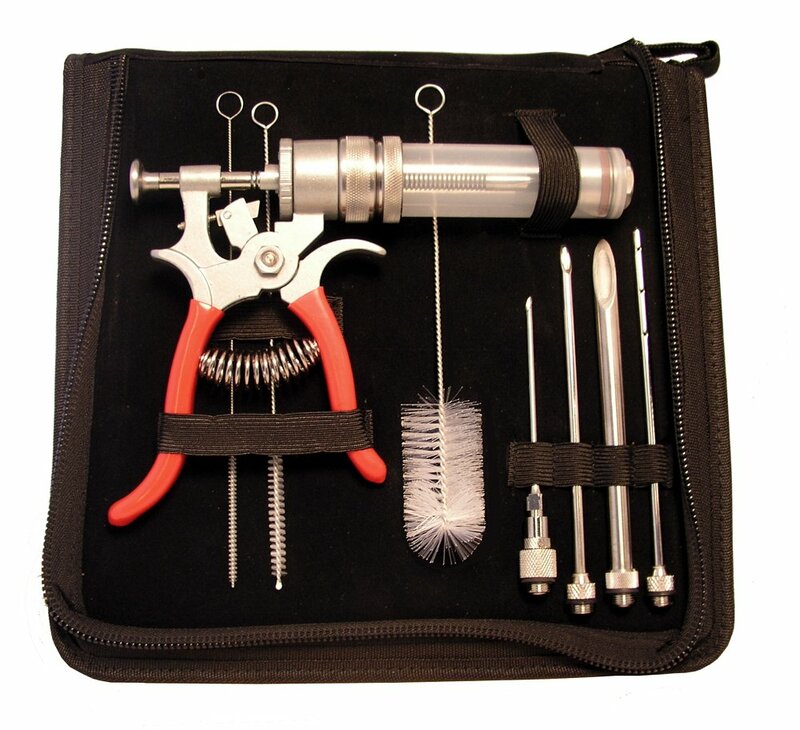 You definitely get what you pay for with the use of this product – a high-quality kind of meat injector. Indeed, using Spit Jack injector is fun and easy. You actually don’t need hard pressure to inject the meat with it, and you can finish it fast. You might even adjust the flow as well as the amount of marinade. 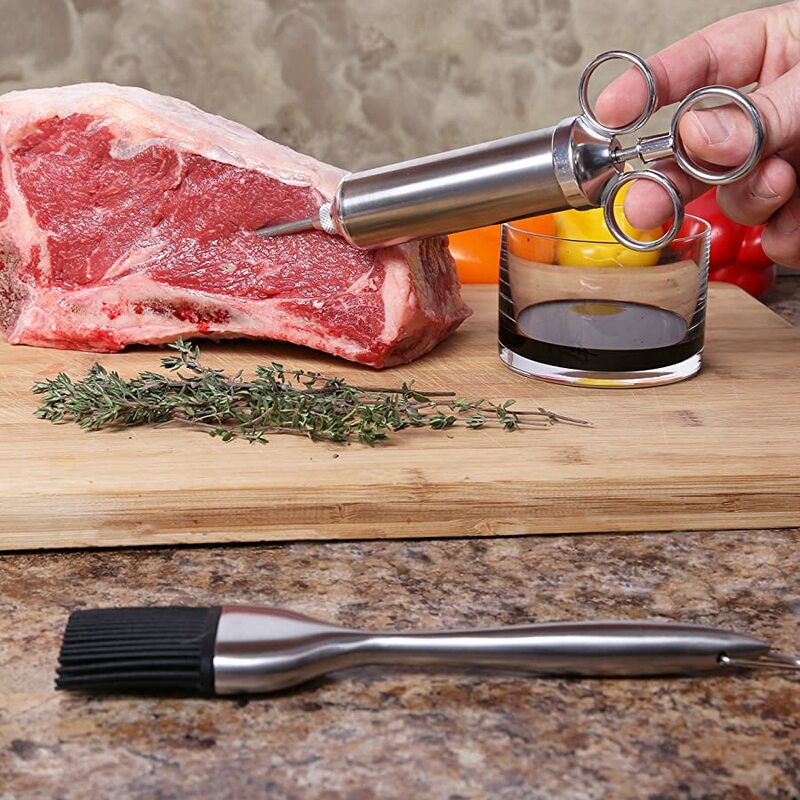 This meat injector looks like a gun, so you only need to poke then squeeze it. Also, this complete set comes with four different kinds of needles along with a cleaning brush. Regarding cleaning, you might think it is so complicated, but the truth is, it is effortless to clean this product. It also comes with a year of warranty once something unwanted happens. But, if you are on a tight budget, you might not choose this one. And this is not a great option too if you are looking for a dishwasher safe meat injector. With this, I could have more time to do something else in the kitchen. But, no matter which one from these products you end up purchasing and using, you are still guaranteed to enjoy a well-prepared meal. For some injecting techniques, click here. If you have other options, or if you have any questions regarding this article, feel free to post your comments below!